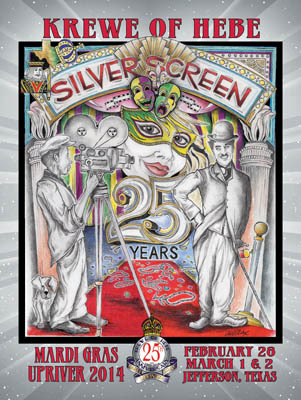 2014 marks the 25th Anniversary of the Krewe of Hebe’s Mardi Gras festival in Jefferson Texas. And it is going to be spectacular; the theme this year is fittingly the Silver Screen. We’re anticipating all kinds of costumes and floats decorated in all the glitz and glory of that time. Without further ado, here is the line-up for February 28 and March 1 & 2, 2014. DOO DAH PARADE – 7:00 p.m.
After the parade everyone usually gathers downtown from 7 p.m. – 10 p.m. at the Main Stage, the band has yet to be determined. For the past 13 years, Michael has been entertaining audiences all across the country. He is a pop-rock and adult contemporary singer, producer, actor and emcee. His moves are smooth, his wit is charming, and his presence is humble. From radio, stage, television and motion pictures, he can do it ALL. Michael is the definition of entertainer. 1:45 p.m. The Motorcycle Parade begins. Followed by the Grand Parade at 2:00 p.m. To get a great spot you had better get downtown at about 1:30 p.m.
Ray is a Texas music treasure, a revered songwriter & performance legend, and an acknowledged forerunner in the Progressive Country movement of the 70’s. During that period his song “Up Against the Wall Redneck Mother”; became a college campus anthem. His enduring career has spanned over 40 years, with the evolvement of 16 albums leading to recent national acclaim and prominent public appearances including “Late Night with David Letterman”. They are a must-see attraction featured in three evening performances. A tribute to the early Beatles’ years featuring Sergeant Pepper and Abbey Road. Don’t let the name fool you though, there are usually many of the floats flowing down the streets one more time just for fun. For more information please visit the Mardi Gras Upriver Website.